I am not good on the computer, and I do not have an e-mail so I cannot order minutes for my phone. You can still buy airtime cards in stores and activate them directly on your phone. There may be a way to order online without using an email address by selecting the "SKIP" option as shown in the photo. However, if you are uncomfortable on the computer, I would NOT recommend it. What I would recommend is getting a friend to help you setup your phone so that you can order airtime directly from your phone and have it billed to your credit card. 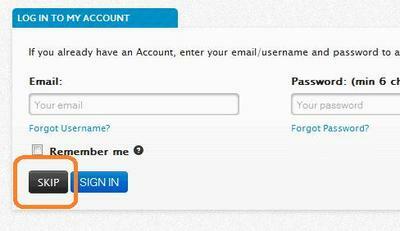 Registering your phone with Net10 using an email address is an optional step. The reason you may want to register your phone with Net10 is to prove that you are the owner of the phone, if the phone is lost, broken or stolen. Registering your phone on the Net10 website is the only way to prove that you are the owner of the phone. Buying airtime online can only be done with a phone that is registered with Net10 using an email account. But if you are not comfortable using the computer you may just want to buy all of your airtime cards from the store. Then use your phone to add the airtime. Most of the new phones have the Add Airtime option in the prepaid menu. Usually when you use the Add Airtime option on your phone, it will take just a few minutes to receive a confermation email that your airtime has been added to your phone. I agree with SB. You may want to get someone to help you make an email account. Then you can register your phone with Net10. I would still buy all of your airtime cards from the store and add them yourself.